While filling out college applications — especially if the school uses the Common Application — you’re likely to come across a question asking you to waive your right to see your letters of recommendation for college. Basically, when you apply, schools are asking you to waive your FERPA right to see these letters related to your educational goals. The good news, though, is that you don’t need to worry about waiving this right. In fact, it’s probably a good idea to go ahead and check the “yes” box and move on to the rest of your application. So what is FERPA? And how does it relate to letters of recommendation? Let’s have a look. Passed in 1974, the Family Educational Rights and Privacy Act gives parents of students under the age of 18 — and students above the age of 18 or in post-secondary school — the ability to access their educational records. On top of that, it says that schools can’t release educational records to third parties without proper permission. It’s a way to give you control over your academic records. There are some exceptions, though. For example, “directory” information, like dates of attendance and birthplace information, can be released. But you also have the right to request the information not be included in the directory. And, of course, the idea is that FERPA gives you the right to view your letters of recommendation after you enroll in the school. Please note, however, that you don’t have the right to see the letters before your enrollment. So if you’re accepted into the school and you enroll, you could take a look at your letters of recommendation, thanks to FERPA. Should I Waive My Right to View Recommendation Letters? So, are you supposed to waive FERPA? The short answer is probably yes. 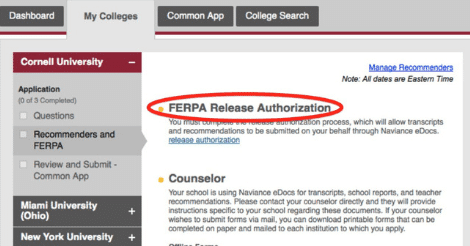 But before you make that decision, let’s take a look at the Common Application FERPA waiver and authorization to understand what it means. When you waive your FERPA right to view letters of recommendation for college, you’re basically saying you don’t need to look at this information. Ever. You say you understand that, even after you enroll in a college, you aren’t going to be able to look at those letters of recommendation. For schools that use the Common Application, this is fairly straightforward. You fill out the application, and one of the things you’ll do is waive your right to look at the letters. Once you do that, you’re taken to a place on the application where you can supply information about the people who are writing these letters. The Common Application makes this easy since it allows you to send the same information (and even the same letters in some cases) to all the schools you’re applying to. If your school doesn’t use the Common Application, they might still have a waiver for you to sign as part of the process. You don’t actually have to sign the waiver to have teachers, employers, religious leaders, and others send in letters of recommendation, but it can actually help your application when you waive your right to FERPA as it relates to letters of recommendation for college. Why Do Colleges Ask You to Waive FERPA Rights? It all comes down to confidentiality. Most universities feel that your letter writers will be more honest if they don’t think you’ll ever be able to read them. When you waive FERPA rights, it signals to the college and — more importantly to the letter writer — that you’re willing to trust them. And it allows them to feel safe in writing how they really feel about you and your accomplishments. If you don’t waive FERPA rights, you might actually be suspect. Some schools might worry that you are forging letters and sending them in separately. Rather than fretting about whether you are supposed to waive FERPA, focus on choosing the right people to write your letters. When you ask someone to write you a letter, it should be someone you trust to write a glowing review of your abilities. In fact, many letter writers will actually show you the letter ahead of time. Not all of them will, but some do as a courtesy. However, don’t ask to see the letter beforehand. Again, the people you ask should be trustworthy and should be people who you’ve built a professional and educational relationship with. Some of your letter writers might even show you a draft and ask you to help them polish it. When asked for this type of feedback, be sure to respond quickly — and gratefully. The bottom line is that you don’t need to see these letters of recommendation. If you choose your letter writers carefully, you can trust they’ll say nice things about you and help you look good for the admissions board — whether they show you the letter ahead of time or not. In most cases, you’re just fine waiving your FERPA rights to see letters of recommendation and then focusing on other parts of the application, like writing a killer essay and practicing interviews. Older PostIs Your College List Balanced With Financial Safety, Match and Reach Schools?